A summer fair! What better way to celebrate the end of summer? Especially with art and fine crafts for sale, live music, poetry, food, and interactive community art projects. The Fleas play at noon! 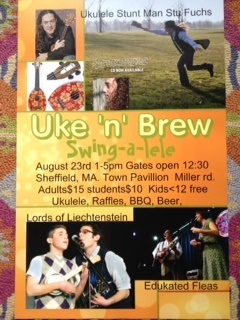 Don't miss this year's Uke 'n' Brew! Sponsored by the Magic Fluke Company and Big Elm Brewing, the event will feature uke performances by the Edukated Fleas, Stu Fuchs and the Lords of Liechtenstein. Jamming! Uke lesson! Uke raffle! Food and of course, BEER. Located in nearby Sheffield, Mass., it's just over the border from CT and NY and is a lovely drive. Under cover, so rain or shine. Bring a chair. This time at the historic Opera House!